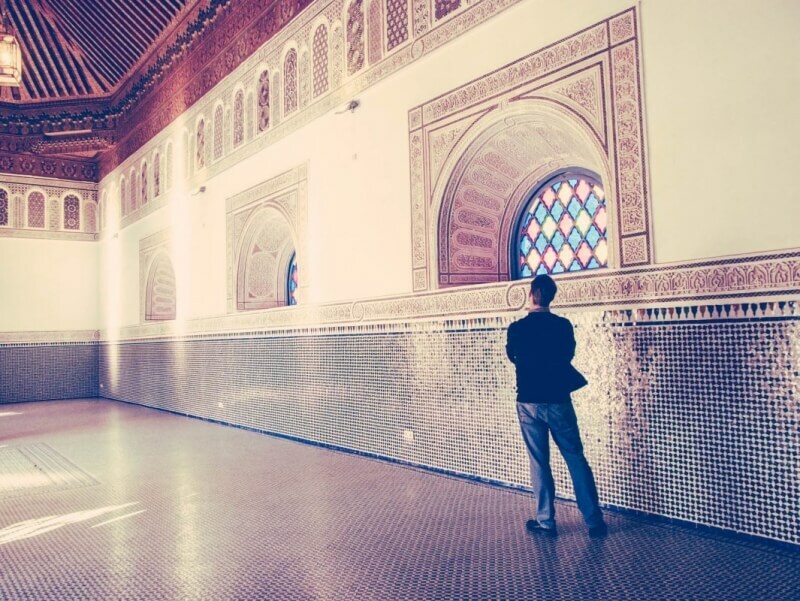 The Bahia Palace in Marrakesh, Morocco (also called El Palais Bahia) is a must-see for photographers. 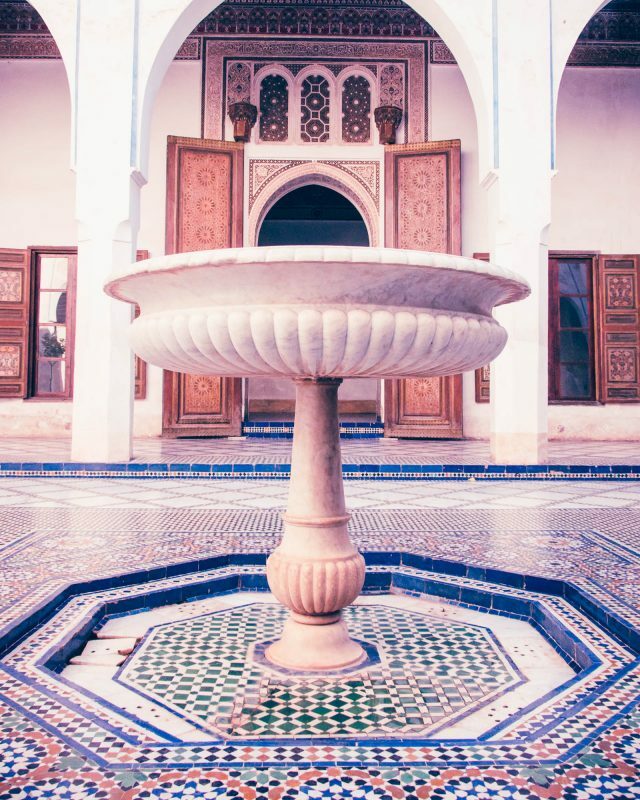 In the hustle and bustle of Marrakesh, you have this beautiful riad with incredibly beautiful tile and woodwork adorning its many rooms and courtyards. Before heading to the Bahia Palace, I checked TripAdvisor and honestly, it was hard to tell if it would be worth it or not. A lot of people were like “boring” or “there is nothing inside” on their Tripadvisor review. But I’m not sure what people expect to see inside. I mean, one person complained about there not being a cafe or a gift shop. Honestly people, you want a cafe inside a beautiful ornate palace? I’m *happy* to not be forced to exit through a tacky gift shop! I mean, it’s not a grand building from the outside like one might expect from a european Palace. 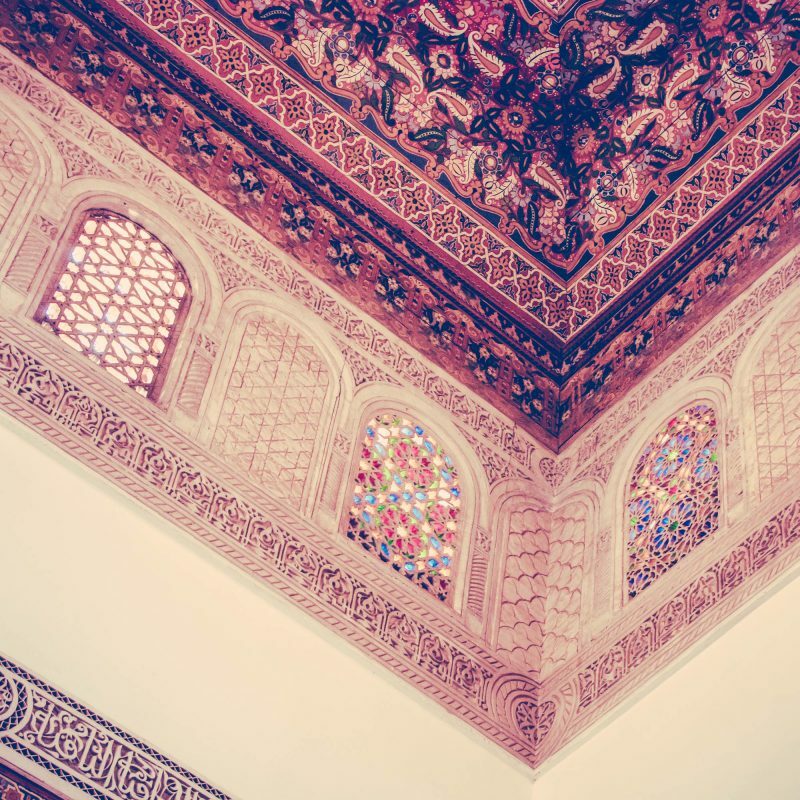 But it is absolutely a masterpiece of Moroccan and Islamic style, art and architecture. Every room has a variety of intricate tile, woodwork, carvings, stained glass, archways, with gardens and fountains in courtyards as well. The only complaint I would have is that there is very little to explain the history of the place. It always makes it more interesting when I know a little about a place. But don’t worry, I looked it up for you! So the Bahia Palace in Marrakesh was built in the late 19th century and its history is interwoven with Morocco’s political history. 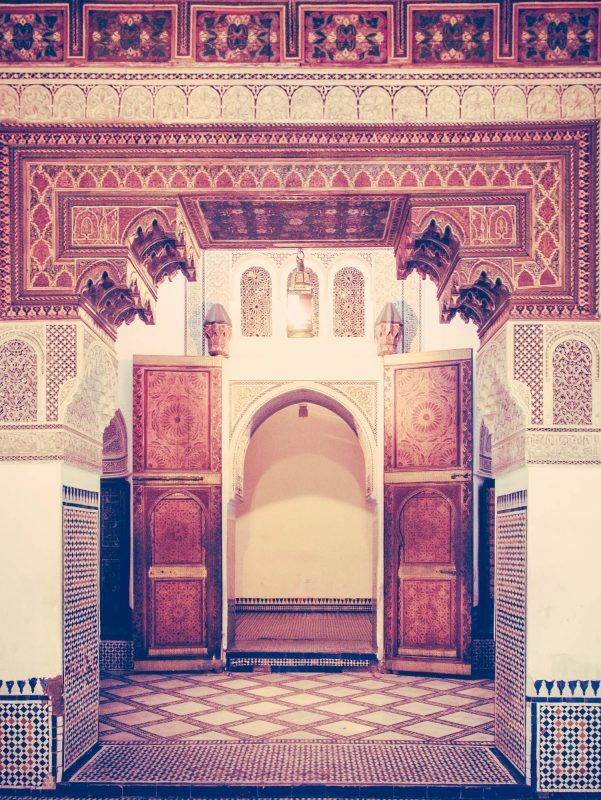 Sidi Moussa, who was the Grand Vizir during the reign of Hassan I, the Sultan of Morocco, built the first part of the current structure – a large riad with the finest materials and the finest craftsmen. Later his son Ahmed ben Moussa took over and expanded the palace grounds and rooms. Ahmed was super powerful and practically ran Morocco because the new sultan was too young and ineffective. He was busy in more ways than one too – with four wives, and 24 concubines! He built rooms for the wives, and a harem for 24 concubines. You can visit the wives’ rooms but the harem is off-limits to the public. One of his wives, his favorite, was named Bahia which means ‘beautiful’ or ‘brilliant. You guessed it – she is likely who the palace was named after. And basically, throughout the ages, loads of various important events also happened there as Morocco’s political fortunes changed – it was looted by a rising rebellion, a French general lived there, the royal family of Morocco sometimes lives there. Its rooms have seen palace intrigues and overthrows, the details of which have been lost to history. 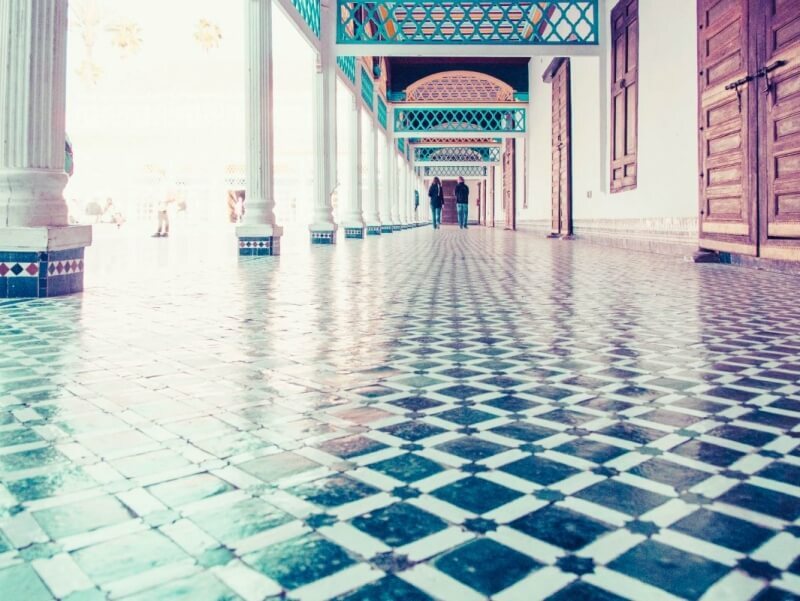 The Bahia Palace is just 10 dirhams to visit, or $1. Amazingly cheap. You can take your camera in and take photos to your hearts delight. There will be a lot of other people there, so it’s best to be patient and look for the moments where you can get most people out of the scene. But the good thing is, there’s not just one view to take in. Pretty much every nook has something beautiful to shoot. Too many people in the room? look up and see if you can capture some great detail up there. Look at those gorgeous patterns – it’s almost like embroidery. Hard to believe it’s patterned tiles, carved wood and stained glass. Wherever you are there’s definitely a different angle you can explore while people are in the way. Sometimes, it doesn’t hurt to capture the people as well. So yeah, that’s my husband being unknowingly helpful by adding some scale to the room. The tiles with the really intricate patterns are called zelliges. These tiles are chiseled carefully by hand into the various shapes and then put together in intricate mosaic patterns. 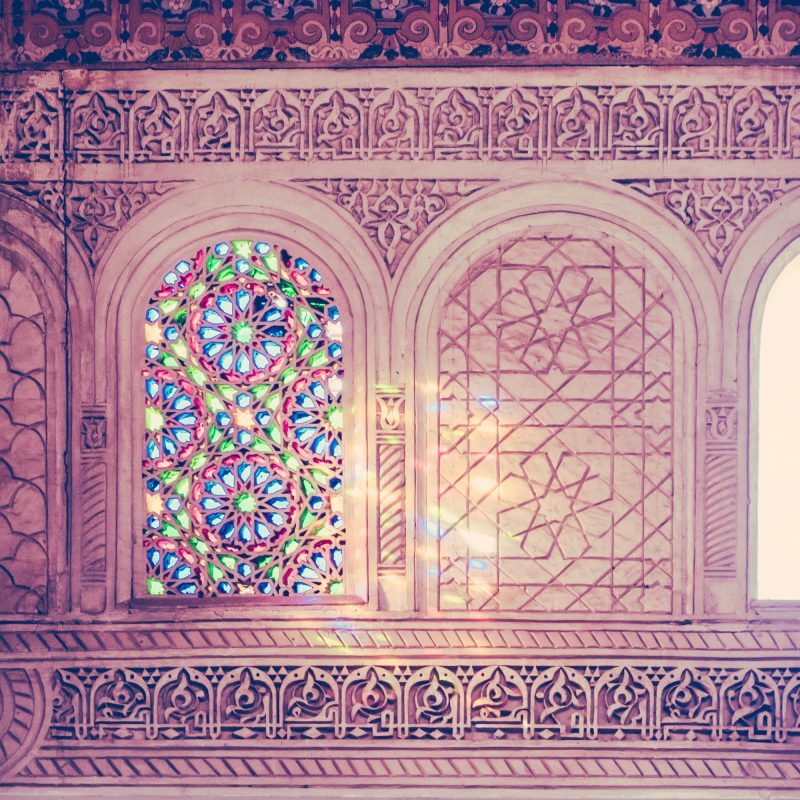 If you think about the work that went into any one wall or window, it’s kind of astounding. Here’s a really awesome video on the process of creating, glazing, chiselling and assembling the tiles. One cool perspective shot to get here is low to the floor, where you can really bring attention to the tiles. You can see the wider and more complex variety of shapes and colors right here at the base of the fountain. Even if the fountain isn’t working, see if there are other details that catch your eye. A beautiful effect to watch out for is the light streaming through the windows into the various rooms. Adds a lot of atmosphere to the shot. Depends on your time of day of course, I was there in the late afternoon. You may need to use a little HDR to ensure you capture the whole range of lighting. Or just fake HDR where you use Lightroom to bring out the shadows and bring down the brights. The Panasonic GX-85 I was using lets you shoot HDR in-camera which is super nice. See why I think it’s the best travel camera here. Frame one doorway within another to accentuate the depth of the various archways and rooms. The sunlight is also not the only light effect to watch out for. The lamps, stained glass windows, all have their own unique patterns that they create. The entire Bahia Palace is a beautiful example of the height of Arabian artisanry, and you can get so many beautiful shots here. It’s such an easy hour or two – no vendors, no gift shops, no rules against photography. The only thing you really have to contend with is other photographers with the same idea. 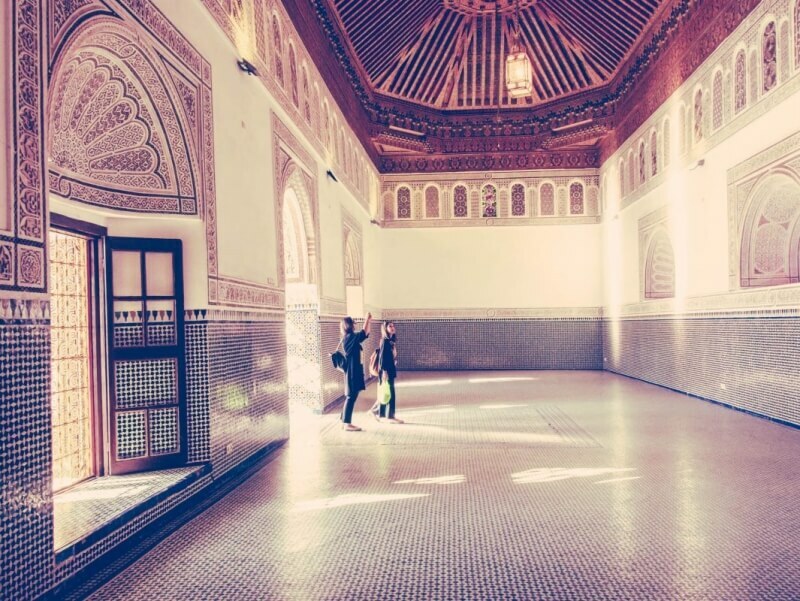 If you want to see Bahia Palace and some other sights with a guide who can tell you more about the history, it’s a stop on the following tours. One note, in my photos I opted for a vintage look using Adobe Lightroom to evoke feelings of days gone past at the Palace. Just in case you wonder when you get there why everything isn’t slightly faded with pink tones, haha. If you frame your shots well, your photos could make beautiful souvenirs to take back home. You can also buy my prints online at Society6. Did you find this post useful? Do comment below and let me know! Thanks for reading.